Name: magnetic Writing Board, Magnet Drawing Board, Magnetic Board, Magnetic memo Pad, Magnet Notepad, pvc Magnet, rubber Magnet. Fridge magnet can be made by paper printing, PVC printing, epxoy, tin metal and soft PVC, it have flat, 2D or 3D effect. The designs, shapes and sizes can be customized, it is widely used in gift, promtion and advertising area. If you want to make custom Fridge Magnetic Writing Board with your logo,slogan,telephone,website,email , please send us your design or give us instructions about your imprint.We'll send a free virtual art proof for your approval,you can ask a real sample with logo before production too. 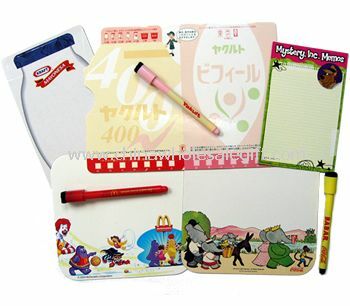 Our Fridge Magnetic Writing Board is popular as promotional,advertising, business,corporate gifts.